IN 2012 during the live opening ceremony of the London Olympics, before millions of worldwide viewers England’s pastoral island paradise emerged to the wafting strains of British composer Edward Elgar. But suddenly the paradise was shattered. A group of belching smokestacks arose accompanied by violent drumming and harsh music. The Industrial Revolution had arrived. Legions of lock-step laborers under the command of black-coated factory owners overran the green land. TV commentators gleefully quoted poet William Blake, describing how the Industrial Revolution’s “Satanic mills” had brutalized the landscape and crushed workers. The ceremony’s creator, they told viewers, had titled this section “Pandemonium,” after the capital city of hell in Milton’s Paradise Lost. This picture has many roots in English history, from Blake himself to J. R. R. Tolkien’s The Lord of the Rings, where all the villains are industrialists with minds “of metal and wheels.” One of those roots is a book from 1949. With the warlike fruit of the military-industrial complex still a stench in the world’s nostrils, French philosopher and historian Elie Halévy wrote a history of England telling how John Wesley and the Methodists emerged in the very cradle of the Industrial Revolution and changed the English landscape forever—on the side, Halévy believed, of the industrialists. Pie in the sky by and by? Methodism was born in the late 1730s in the middle of political and economic crisis, working-class strikes, and riots. 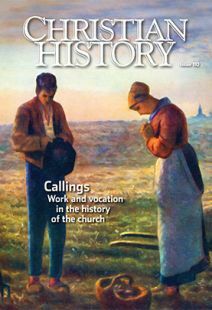 In the midst of these crises, Halévy argued, middle-class Methodist leaders led their working-class devotees to seek spiritual, rather than temporal, solutions to the difficulties they faced—turning the minds of the new converts away from the oppressive conditions in which they worked and toward their eternal destinies. At the same time, Halévy made no bones about it: Methodism changed everything about English society. The movement’s bedrock morality and voluntary obedience to a freely constituted religious organization seeped into all the institutions and ideas of England— her science, art, literature, education, and political debates—and contributed to an unprecedented social stability that kept England from the kind of bloody revolution that France experienced. The movement’s influence even successfully jumped fences into the Presbyterians and Baptists and the venerable, wealthy, established state Church of England. But as it did so, Halévy’s tale went, Methodism lost something. As it grew in influence, Methodism moved increasingly into the center of successful society, where its adherents found no contradiction between moral growth and commercial gain. In achieving commercial gain, Methodism lost its working-class soul and the desire to protest against black-coated factory owners. Or did it? That influential portrait of the movement was flawed in several important ways that go to the heart of the Methodist theology of vocation. First of all, Methodism was not a movement from the top down (with the possible exception of John Wesley himself, a man of strong personality and even stronger desire for order). It was a movement from the bottom up. Many early Methodist leaders came from the working classes. Rank-and-file Methodists had a strong sense of ownership of the movement’s institutions, including class and band meetings and Sunday schools, in which working folk were active participants and leaders. They enjoyed a kind of spiritual—and for a while gender—egalitarianism that spurred them to lead a wide array of efforts in religious and social reform, including Sabbath observance, Bible distribution, and, perhaps most crucially, the abolition of the British slave trade. On any given Sunday, the great majority of Methodist pulpits were occupied by local preachers “on the plan”—that is, preaching every few weeks, but still laboring in their secular vocations as well. In this the movement’s leadership reflected its membership, nearly 60 percent of whom were skilled craftspeople—workers who enjoyed relative independence and sought decency and self-respect in their work and social lives. The rules of the land allowed “nonconforming” churches to operate in the very shadow of the established Church of England. Methodism thrived there as a voluntary association freely supported by its members, who resembled sturdy, self-reliant English workers more than the cowed factory slaves some twentieth-century labor historians took them to be. Even famous Methodist sermons preaching responsibility and lecturing against drunkenness—sermons attacked by later historians as simply creating docile, sober, industrious factory men—were usually not imposed from above. Most arose from below as Methodists, finding that responsibility had transformed their own lives, preached it to others. Wesley himself lived his entire life on the same salary he had received as a fellow of Lincoln College, £28 a year, and devoted the profits from his books over and above that to advancing the Methodist movement and assisting its members. In his eighties he preached a sermon in which he observed with great regret that Methodists had almost universally failed to “give all you can.” He claimed his fears had come to pass: the love of money had reared up and stolen away much of the energy and focus of many Methodists. That this freedom and ambition of the Methodists took social and economic forms should not surprise us. Famously many of the miners of Cornwall—even mine bosses—were Methodist lay preachers, whose communal cohesion and Christian virtues changed the way they did business with other workers and with management. In fact, Methodist societies attracted many of their worshipers precisely through their offer of a more purposeful, disciplined way of life. Workers responded partly because they found the industriousness and financial prudence preached by the movement to be a solid means for self-improvement and material success. The liberty, fellowship, discipline, and emphasis on personal moral responsibility of the large and growing Methodist movement transformed the economic sphere and ensured individual Methodists a central and successful place in the new industrial economy. At some times, when faced with injustice, Methodists did resist the new industrial order. But at many other times, they embraced it—for Methodist reasons. These reasons stemmed, of course, from John Wesley’s teachings. In many respects John Wesley had the sensibility of a businessman. The world-engaging Anglicanism of his father, the hard-working, strictly disciplined Puritanism of his mother, and his Oxford education all joined together to mold a leader of intense piety, fevered activism, and organizational genius. Although he was deeply concerned about the love of money becoming an idol, damaging people’s relationships with God and others, Wesley was not averse to promoting economic work in the secular world as a means to promote human thriving. He taught his people that when well handled by Christians, money could become food for the hungry, drink for the thirsty, clothing for the naked, rest for the traveler, support for the widow and the orphan, defense for the oppressed, health for the sick, even life for the dying. True, Wesley’s impulse to help believers thrive economically and create better social structures was secondary to his impulse to see individual hearts transformed. But he famously did not believe that any such thing as a “solitary Christianity” could exist. Wesley addressed communal, organizational forms from the beginning of his ministry, creating structures that discipled people and created community. Those structures—from “societies,” which encompassed all Methodists in a given area, down to “bands,” which met as small groups focused on in-depth spiritual growth—gave people accountability and help as they journeyed toward wholeness. Methodist structures taught people not only the chief doctrines of the Christian faith, but also how to live well in all the dimensions of their lives. They provided secure communities in a world in which industrialism and urbanization were tearing apart old social structures. They taught a new ethic of love and social responsibility. And they taught that true holiness was not a matter simply of what goes on inside the heart—it must be externalized in service to others through works of mercy and even honest business practices: refusing to lend money at unreasonable rates or to borrow when the ability to pay back is uncertain. In fact, the origin of the Methodist small groups known as “class meetings” was financial, not theological—they met as a way of easily collecting from each member their weekly contribution for the relief of the poor. The heart and soul of Wesley’s vocational teaching was his refusal to abstract spiritual lives from material lives. So he provided a pattern of “this-worldly asceticism” not just applicable to prayer closets or churches. He taught that holiness healed and redirected disordered “tempers,” and he encouraged his people to live in ways marked by integrity and authenticity. As their hearts were transformed, their work soon followed. Wesley’s ministry-long conviction was that sanctification—holiness of heart and life, having the mind of Christ and walking as he walked—was the epitome of Christianity, the “house” into which the porch of repentance and the door of justification by faith led. Holiness was a love for God first and foremost and an active love for others pouring out from that. Wesley understood that how people work is a significant part of how they love others. So, following a Lord who healed bodies as well as souls, he gave medical advice, published folk and herbal remedies for the use of his people, and started dispensaries to distribute medicines. He taught a salvation that was not just a “way to heaven” but also a “way on earth”: get the heart in order, and good, ethical actions will follow—in the marketplace as well as the church, home, and public square. Wesley emphasized that there were many “means of grace,” many spiritual disciplines to practice to become better people. His most common list of those means of grace included “works of piety”: prayer, searching the Scriptures, fasting, the Eucharist, and “Christian conferencing” (meeting together as believers). But he also included “works of mercy” on the list. Feeding the hungry and clothing the naked were spiritual disciplines for Wesley, not only social acts. To writers such as Halévy, and perhaps to the planners of the London Olympics’ opening ceremony, any Christian movement worth its salt should have risen with a robust socialist response to the forces of industrial capitalism. Believers should have stood against the injustices of new economic developments, rather than participating willingly in those developments and establishing virtues related to productive work. But that is not what happened with the early Methodists. While they addressed the social fallout of the new industrial realities, they also discipled people in ways that did not begin and end in heaven, but on earth. From the beginning Wesley believed that evangelism must be accompanied by hard work, education, thrift, and grass-roots leadership if converts were to be prepared for both spiritual and social-economic fruitfulness. Chris Armstrong is senior editor of Christian History and director of the Wheaton Institute for Faith and Vocation. For more on this topic, see “Eating bread with widows and orphans” in Christian History issue 104.